Ah yes, that most famous tale of mistaken identity and edible grandmothers. The forest is a dark and mysterious place kiddos, and strangers are better left unspoken to, if you catch my drift. Orton Jones' drawings are almost huggable in their Hummel lushness, making you wish you were a wee tot wandering into those gorgeous woods. Not even an evil wolf could keep me from scooting down that path, people. Toadstools, moss and shadows, oh my! My son is terrified of wolves for a medley of reasons, but thankfully for some reason this one doesn't spook him too bad... odds are he doesn't mind because he gets to imagine the woodsman hacking him open at the end to retrieve Red and her granny. What boy wouldn't wanna see that story out to the end? 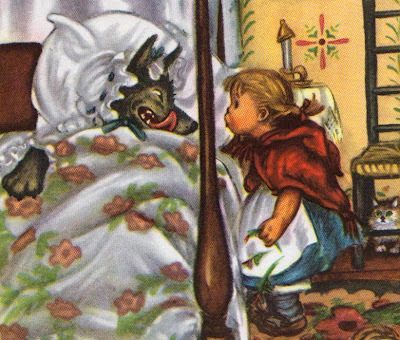 A passing woodsman stepped into the house to see how Little Red Riding Hood's grandmother was feeling. And when he saw the wolf, he said, "Ah ha! I've found you at last, you wicked old rascal!" He lifted his ax, and with one blow, killed him. Then he cut the wolf open and out stepped Little Red Riding Hood and her grandmother. Awesome! Not for the faint of heart, it's one that's sure get their imaginations revving. wow, little red riding hood! reminds me of my kinderschool days where we had a play on fairy tales.. I love this book! 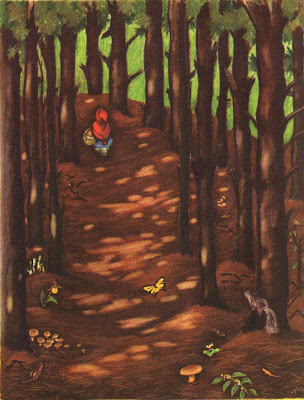 The illustrations are beautiful and classic...although Little Red does look alittle creepy on the cover. Nonetheless, I LOVE this! is there a possibility to post some more illustrations from that book? I LOVED ELizabeth Orton Jones. We've read TWIG and Big Susan (also by Jones) and she's a biggie in our house. I know that you'll never see this comment being on a post from '08, but thank you, thank you, thank you for having this in your archives. I had no idea she illustrated for Golden Press. Nothing of the kind is listed in her bibliographies. 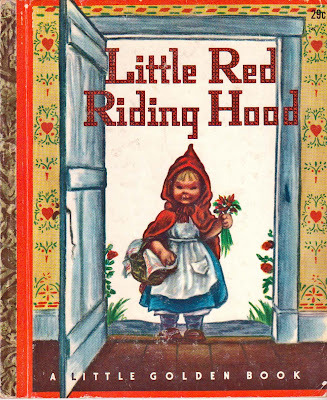 I'm looking for a copy (or information on) Elizabeth Orton Jones Little Red Riding Hood where she takes Grandma wine rather than grapefruit juice. I have a copy, but it is in very poor condition. I believe there were people upset with the wine and it was changed. Dates are 1948 on both and probably not too many copies of the original. Etsy Sale and 3 Swell Giveaways! !